The unidentified bank robber is believed to have robbed at least four different banks in the past two months, most recently in Bothell on October 23. The subject may be a white male, between 5’9” and 6’0” tall, of thin build. 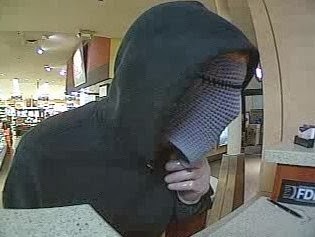 During the robberies, he covered his face with a distinctive cloth and wore the hood of his sweatshirt over his head. He has also worn clear, latex gloves. Anyone with information as to the identity or whereabouts of the suspected robber should refrain from approaching him and is urged to contact law enforcement immediately. Anyone with information that can help identify this individual is asked to call Crime Stoppers at 1-800-222-TIPS (8477). Callers to Crime Stoppers may remain anonymous and are eligible to receive a cash reward of up to $1000.00 if the information given leads to an arrest and charge of the person(s) involved. Callers may also reach task force officers Detective Mike Mellis at 206-263-2086 and Detective Steve Hoover at 425-452-7868. The Seattle Safe Streets Task Force includes members from the FBI, Bellevue Police Department, Auburn Police Department, King County Sheriff’s Office, and Seattle Police Department.